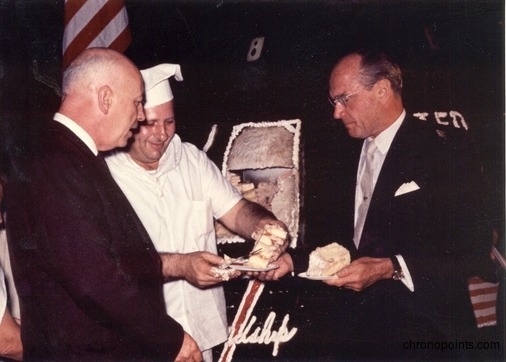 At an event in honor of the return of astronaut John Glenn (1921-), who had become the first American to orbit the Earth, Henri Landwirth (1927-), a hotelier in the area, had a cake baked. 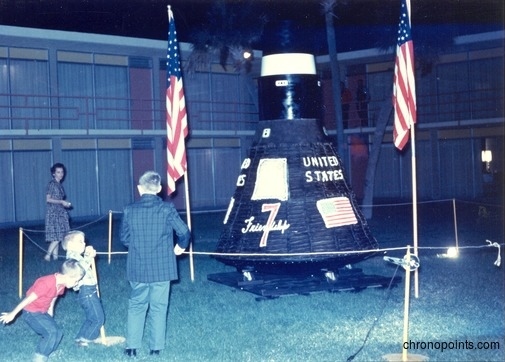 The cake was between 700-900 pounds and shaped like the Friendship 7 Mercury capsule. 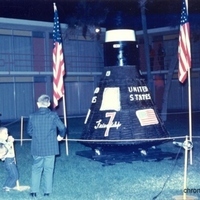 Landwirth had the cake baked in mid-January of 1962 for Glenn's expected launch. However, Friendship 7 was delayed and did not launch until February 20. Landwirth had to improvise refrigeration of the cake in the delivery truck by using airconditioners, to assure it did not spoil. On February 23, Glenn arrived back at Cape Canaveral, Florida. Original color photographic prints, February 23, 1963: Private Collection of Dr. Calvin D. Fowler. Digital reproduction of original color photographic prints, February 23, 1963. Teitel, Amy Shira. "Vintage Space Fun Fact: the 900-pound Cake." Amy Shira Teitel, February 23, 2012. http://amyshirateitel.com/2012/02/23/vintage-space-fun-fact-the-900-pound-cake/. 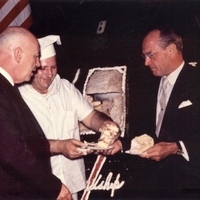 “Cake in Honor of John Herschel Glenn, Jr. and Friendship 7.” RICHES of Central Florida accessed April 26, 2019, https://richesmi.cah.ucf.edu/omeka/items/show/6410.